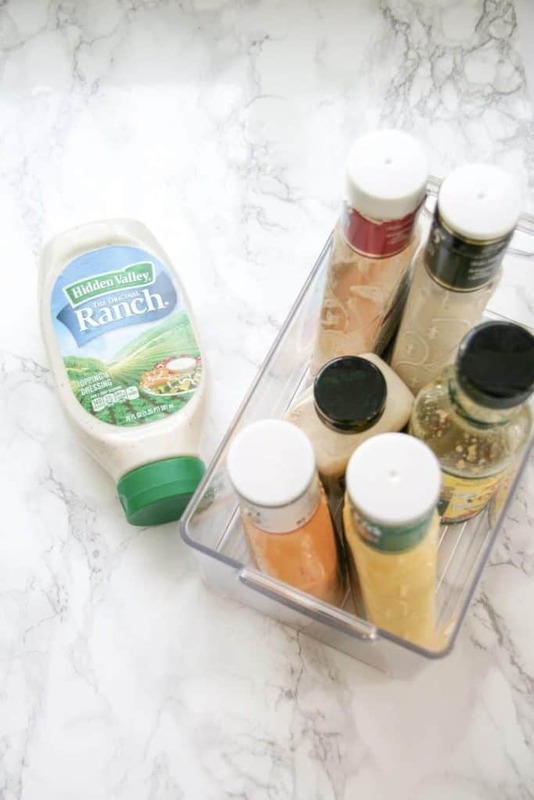 Today we are talking about fridge organization! I got the idea for this post because I just hate wasting food. It hurts my soul. Not to mention, food waste is a huge problem in our country. I wanted to figure out the best way to organize our fridge so our food stays fresh as long as possible. It’s one of my missions this year. 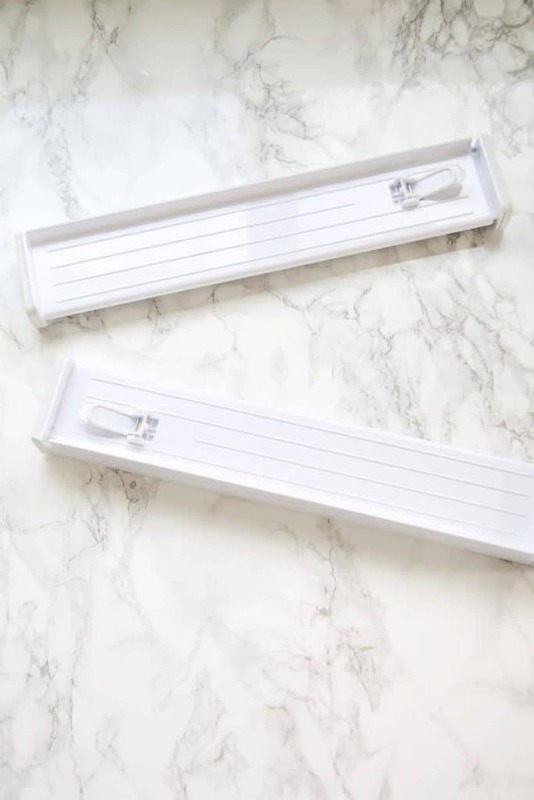 After doing some research and with the help of some handy gadgets – I’ve figured out the best way to store food in your fridge. 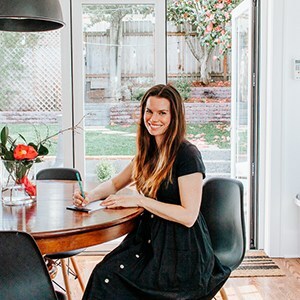 Read on to learn these simple tips! 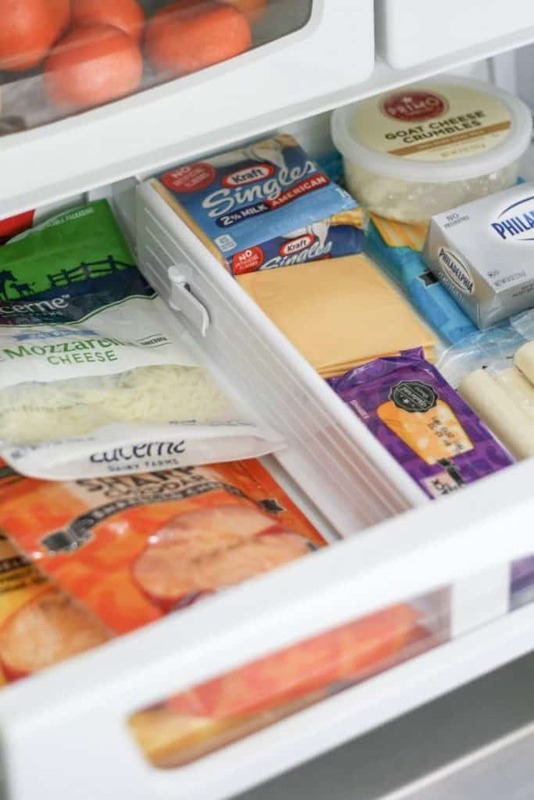 Your fridge temperature should ideally be set around 37 degrees F.
The back and lowest shelf of the fridge is often the coldest area (that includes the meat keeper drawer too). Raw meats and fish you are going to prepare for the week should be stored here. Eggs too. Although I store my eggs on the upper shelves and never have an issue. 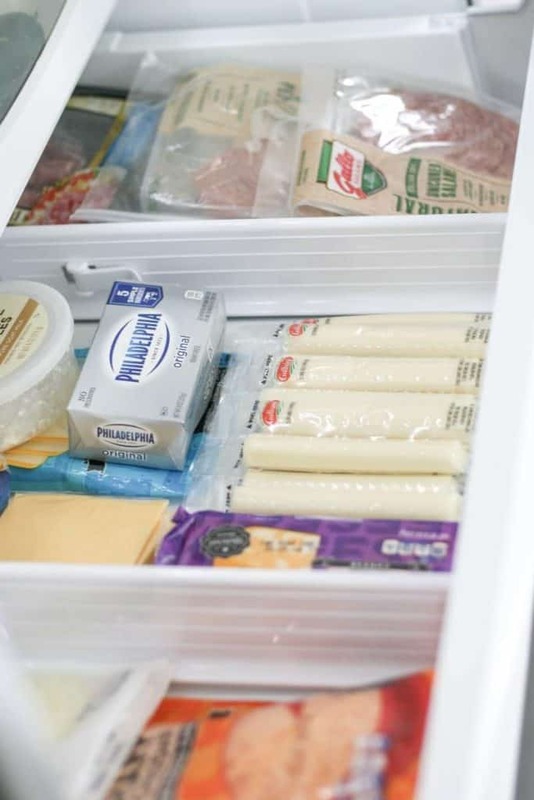 Cheeses can be stored in the meat keeper drawer as well. The warmest part of the fridge is the door. It’s good to store condiments, butter and juice here. No eggs or milk! The top shelf of the fridge is often the most stable in temperature. Leftovers and drinks store well here. I also store my eggs here! You should only wash your fruits and veggies before you’re ready to use them. Some people swear by immediately washing their produce with a mixture of water and vinegar. Those fridge drawers serve a purpose! Store your veggies in one and your fruits in another. Veggies like a bit of humidity. So you can turn that dial over to higher humidity. You may need to test to see exactly what works for you. Fruits, like apples, pears and citrus fruits, like low humidity. I turn mine all the way to low. 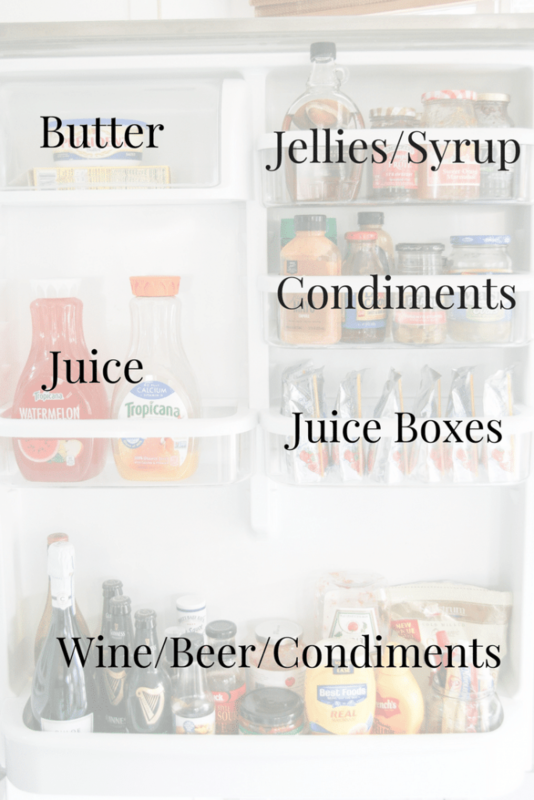 Try to keep your fridge clean, dry (wipe up spills immediately) and uncrowded. An overfilled fridge doesn’t circulate air well. 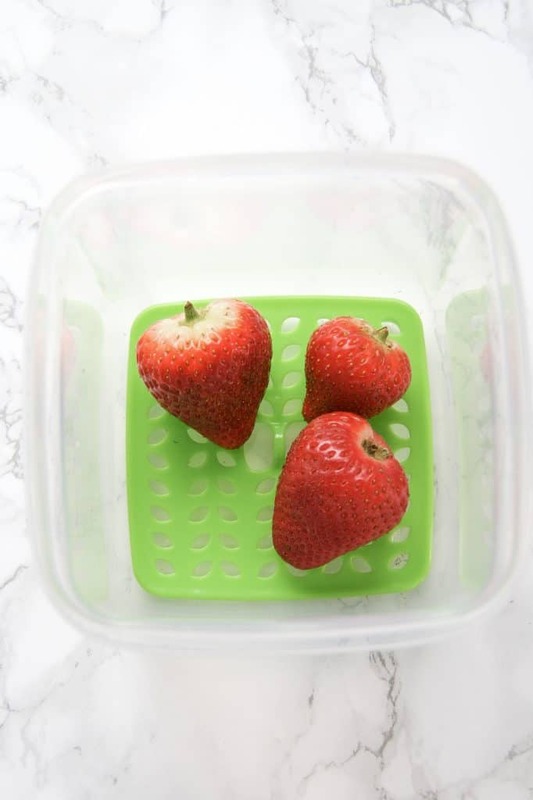 I found a few handy gadgets that help me organize and are good for keeping produce fresh longer. I’ll start off with these Rubbermaid Fresh Works Containers. I tried them on a whim, mainly to keep our berries fresher longer. The reviews were good and I thought, what the heck. They work for us! Our berries are definitely lasting longer than usual. There is a “fresh vent” on the top that lasts forever and never needs to be removed. So don’t worry – you are not forced to buy any new filters. Your produce sits on top of a “crisp tray”. That’s the green tray in the picture. This keeps it away from moisture and allows proper airflow. They are BPA free and everything is dishwasher safe. So far, I just have the small and medium size, but Amazon sells additional sizes. This would be perfect for our green beans too which seem to go bad rather quickly. 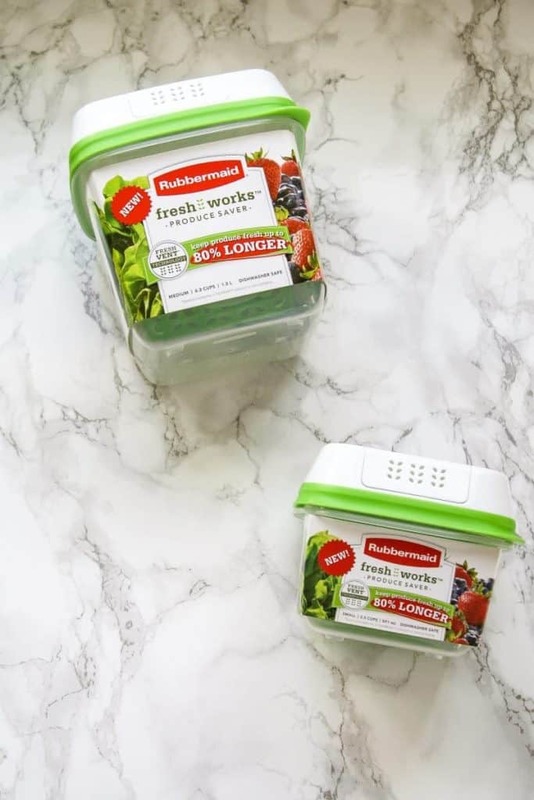 Rubbermaid specifically states not to wash your produce before putting them in this container and to only wash them right before you are going to use them. A couple other tips : my freshworks containers can build up a bit of moisture on the inside so I sometimes just do a quick wipe out to keep it dry. Also, sometimes a bit of water can pool underneath that crisp tray. I also dump the water out occasionally. It doesn’t bother me to do the extra work for longer lasting produce. I’m a huge fan of these acrylic organizers. You can see what you have and everything is kept corralled together. 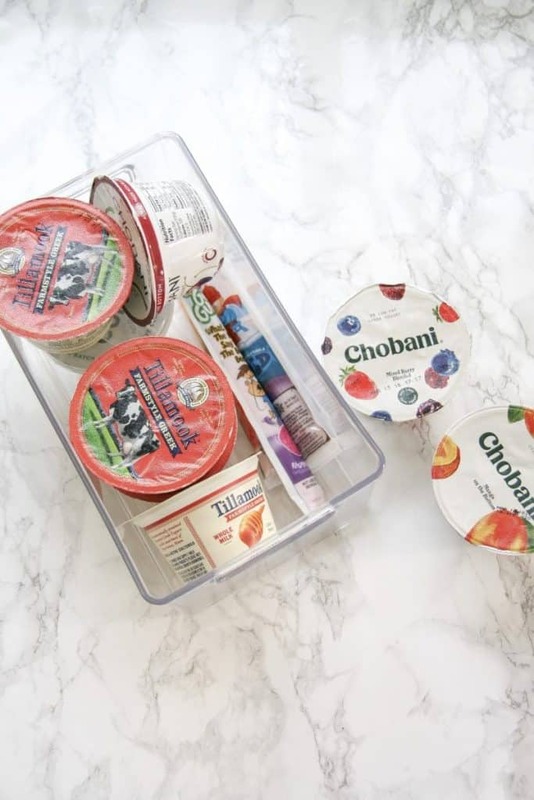 No more lost yogurts going bad in the back of the fridge! I use this one for my eggs. It holds 21 eggs. They have different sizes, but we eat a lot of eggs in our house. I love that you can store stuff on top too. I use two of these clear bins to hold yogurts and salad dressings. This tip is pretty handy. You know how they now have the tomato and anchovy paste in the tube? (best invention ever). I use an old glass jar to hold all my “pastes” together. They used to get smashed in the bottom of the door compartments. 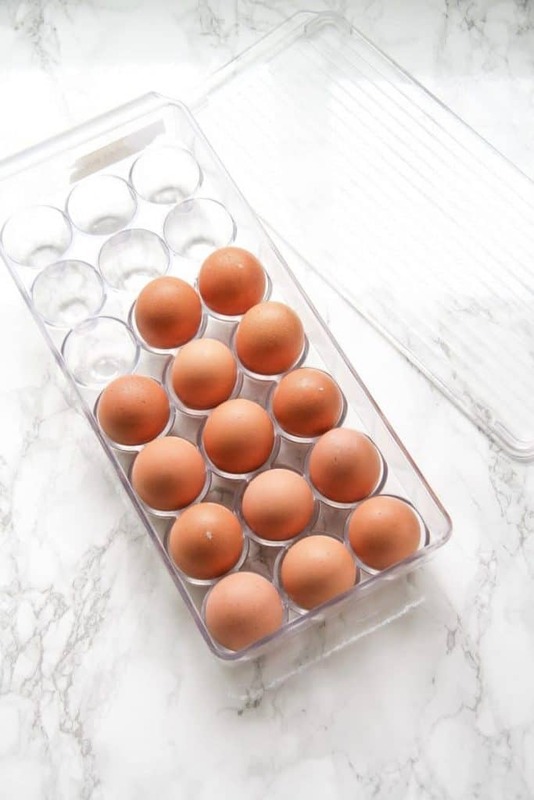 Related : Click here to check out my favorite acrylic bins for organizing. I was also looking for a way to organize my “meat drawer”. I keep cheeses and lunchmeats in there mainly. It was a terrible mess and some stuff was getting lost in the back. Or I was buying two things of it because I thought we were out. So I purchased a set of these drawer dividers. I made sure they fit the drawer first (especially the height). They can be expanded lengthwise. I used two and made three sections of out my meat drawer. One section for shredded cheese, one for string cheese and hard cheeses, and the other section for meat. The package comes with four so I have two leftover to use somewhere else. They work great for me! Now, let’s get cracking. Don’t break any eggs though. 🙂 In order to organize, we need to start with a clean slate. We are going to take everything out of our fridge and wipe down all shelves, drawers and walls with soap and water. Throw out the yucky stuff. And that sauce you haven’t used in 8 months. Here is how I organize my fridge. 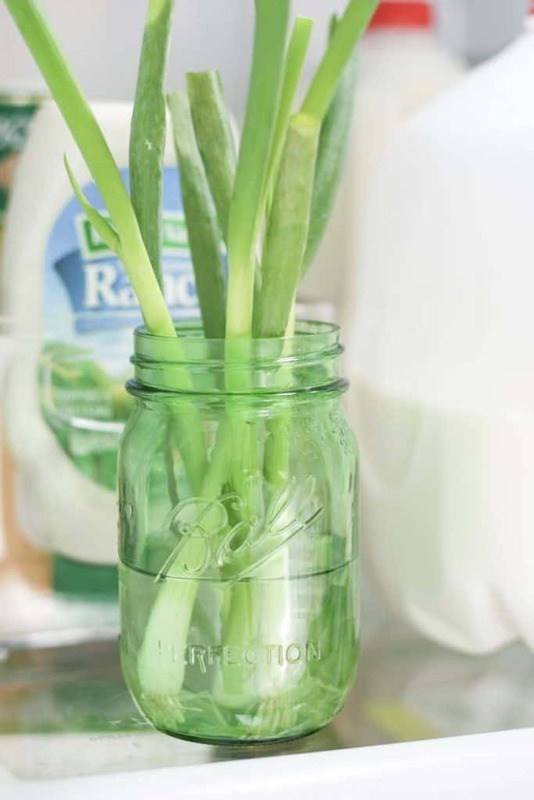 I struggled with keeping scallions fresh until I figured out this trick. Store them upright in a water filled container. You can cover them with a plastic bag but I actually keep mine open. And they don’t get smashed in the veggie drawer either. This also works for asparagus. And herbs. Here’s a glimpse of our fridge door too. It helps to keep like items together – so I have one compartment for jellies and maple syrup. Another for condiments/olives/pickles. A place for everything and everything in its place, right? Wrap celery in tinfoil to keep it fresher longer. Store herbs in a jar with water (like flowers). You can also put it in the fridge. I keep mine on the counter. Wrap saran wrap around the stems of bananas to keep them from ripening too fast. Store onions and potatoes away from each other in a cool, dry place. You can store apples with potatoes though. Apparently, apples keep potatoes from sprouting. Haven’t tried this yet though. I keep my onions in this handy onion bag hung away from my potatoes and they last pretty long for me. Store lettuce directly in your salad spinner. Wash, then spin it dry and put it in the fridge. Dry lettuce is the key to keeping it fresh! The inner compartment will keep the moisture off the lettuce leaves. Use this guac lock container to keep your guacamole fresh and green. 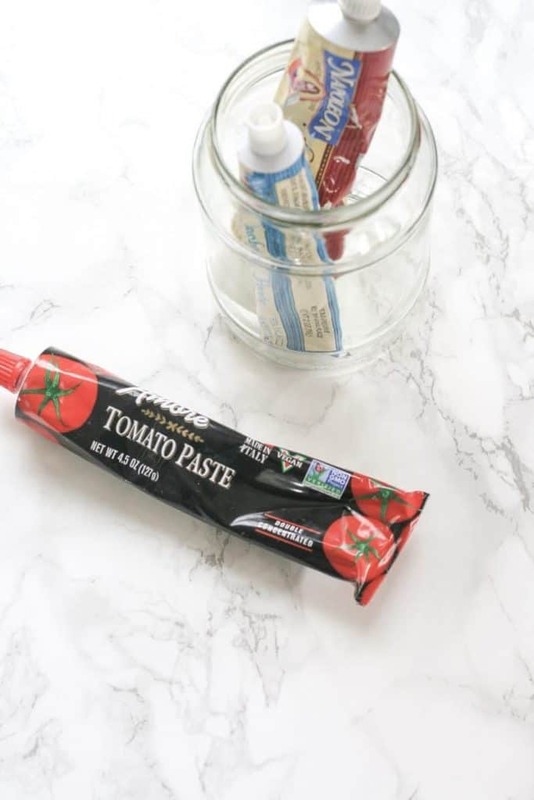 I’m still on the fence about this one – I always store my tomatoes on the counter. But I also read you can store them in the fridge too once they are completely ripe. Too much heat and sunlight after they ripen is not good for them. Hmmm…. Here’s another one that shocked me! Store your cucumbers on the counter (away from tomatoes, bananas and other high ethylene producers. I read that cucumbers can be sensitive to cold temperatures. I do love a chilled cucumber though! I might try this though. I hope this helps you guys organize your fridge and gives you some good tips for your produce and meat. I will say too that my Instant Pot has been a lifesaver. I can cook meals from frozen and you would never know it. And it doesn’t take long to make a meal. It’s my new favorite kitchen gadget for sure. Making hard boiled eggs in it might just be my favorite. It’s so dang easy!! Here’s one last tip – if you can compost your food scraps instead of throwing them in the garbage, that really helps with food waste. Its so much better for the environment. It reduces landfill waste and the awful greenhouse gases they produce. Recycle too while you’re at it! What are some tricks you learned for keeping produce fresher? I’d love to know!